On May 4th, Vice President Dan Quayle (and wife Marilyn) flew to Cordova. A little before they arrived on Air Force 2, Quayle’s advance team came in on Wilburs Airline (a small commuter airline). Accompanying the advance team was our mayor, Erling Johansen. Their flight was so bumpy that one man’s seat broke loose and he was rocking back and forth on one bolt. The plane landed so hard that the front landing gear collapsed and the plane skidded on its nose to a stop. Local DOT employee, Robert Cunningham rolled the fire department crash truck out of the station and pulled up to the wrecked plane which was not on fire. Mayor Johansen stepped from the plane and Cunningham remarked, “God, you’re everywhere!” Johansen smiled whimsically and walked off. Shortly thereafter, Air Force 2 landed, rolling passed the skid marks, the wrecked plane, the fire engine, and the sign saying “Welcome to the Mudhole Smith Airport” for all the passengers to see. Quayle, wearing his James Dean “Rebel Without a Cause” red nylon windbreaker, and his wife deplaned as though they were not at all surprised. "and furthermore...hey...hey...Are you guys listening?" When'd they put that reef there? I am a 34-year veteran with the Cordova (Alaska) Volunteer Fire Department. The 40-member fire department provides structural, and marine fire protection, level-threeEMS, underwater rescue and recovery, and search and rescue services for the north coast of the Gulf of Alaska. I am the past president of the Alaska Fire Chiefs Association, a state certified Level-IV instructor, and an adjunct instructor for the National Fire Academy. I was instrumental in creating numerous fire service courses and authored the 160-hour Senior Fire Officers Course covering NFPA-1021. In Alaska, this book is available FOR $19.95 at the following stores: Barnes and Noble, Borders, Title Wave Books, Fred Meyer, Walmart, military bases, and some Carrs/Safeways. For internet orders, the following dot-com outlets carry this book. http://www.alibris.com/ http://www.amazon.com/; http://www.amazon.ca/; http://www.amazon.co.uk/; http://www.amazon.fr/; http://www.amazon.de/; http://www.barnesandnoble.com/; http://www.biggerbooks.com/; http://www.booksamillion.com/; http://www.bookstore.prwp.com/; http://www.buy.com/; http://www.cheapestbookprice.com/; http://www.compareshopbooks.com/; http://www.dealoz.com/; http://www.booksense.com/; Other foreign outlets can be located through http://www.bookfinder.com/. 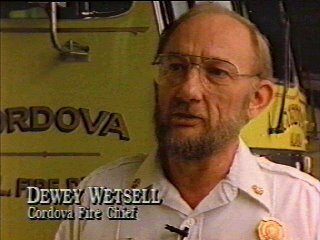 Since there are so many book titles starting with the word "Fire", the fastest locate is by typing my name Dewey Whetsell in "search" / "author". Readers of the first edition of this book discussed within their own groups numerous topics they found useful in the emergency operations portion of this book. That’s not surprising, even though this book initial began as a memoir…not a text book. All of the officers of the Petersburg (Alaska) fire department were issued copies because of the tactics explained. And the marine firefighting stories were the basis of a class at the most recent conference of the state’s firefighters and fire chiefs associations held in Valdez. 1. The author suggests that the murder described on page 257 was a result of “Mean-World Syndrome”. Do you agree with his view of the shooter? Do you believe such a syndrome exists? Are there any known “powder kegs” in your service area around which you should be extra cautious? 2. In the chapter “Working with Cops and Other Miscellaneous Gun Calls”, the author described his fire department’s duties during hostage or barricaded-gunman situations. Is that cooperative duty something your department could or would be willing to offer local law enforcement? Is it something they might need? 3. In the same chapter, on page 95, the author presented a theory about the root-cause of the disparity between firefighters (particularly volunteer firefighters) and local cops or State Troopers. Do you agree with the author’s analysis of the causes of these conflicts. Is this a problem in your area? Can your discussion group imagine workable solutions? 4. Starting at the bottom of page 255 you read about the strange phenomenon that occurred between the author’s police officer son and the Asian gang member. The cause of this remarkable and instant rapport is really worth examining. Who, within your group, has ever experienced such a mutual turn-around? Was it intentional or accidental? 5. Racism and other forms of discrimination can divide departments into warring camps. Do you agree with the author’s view of the root-cause of this problem? How many exclusive “camps” can you identify in your department? Age, gender, race, economic income, political view, religious view, education, regional (urban vs. rural) are some camp criteria; criteria for “tribes” (as seen starting at the bottom of page 246). Are there irreconcilable differences and infighting within your membership? Is the author’s remedy workable for your department? Maybe beer-drinking should be prohibited for your discussion-group during this topic. 7. Page 249 (bottom) states that a volunteer fire department runs on Morale─not funding, not policies─ Morale. But if you take a positive and energetic department and “infiltrate it with a back-biter, sniveler, chronically negative person, and I’ll show you a department that can be destroyed in a year.” Do you agree with that statement? What do you believe is the greatest threat to department morale? Would the author’s remedy of this problem work in your department? 8. In the section “Conducting a Confrontation” (starting on page 277), did you find the planning process and checklist helpful in calming your anxiety about an upcoming confrontation. Do you feel assured that the plan will keep you on track, keep you in charge…make the event less unnerving? 9. In the chapters “Scabs Galore” and “Ammo for the Union” is a storehouse of generally unfamiliar management information. If 85% of American communities rely on the use of volunteer firefighters, at what point is a City running too high a risk by refusing to employ any paid firefighters? Is the statement (on page 220) commenting that you can employ as many paid firefighters as can be funded by a budget equivalent of 2.5 – 3 mills valid in your service area? Which of the general guidelines in these chapters should be modified for your service area? 10. Responding to disasters is tough enough just dealing with the incidents that come at you from outside. It can be made worse by adversity from within. You read on page 181 how (during the Exxon Valdez oil spill) Alaska’s lead emergency responder was stopped cold by the State’s highest-ranking budget officer, then remarked, “Oh, great. The elephants are stampeding, and we’re tripping over piss-ants.” Why did that roadblock not occur in Nova Scotia after the crash of SwissAir 111? What did the Canadians do differently? See page 174 and discuss.